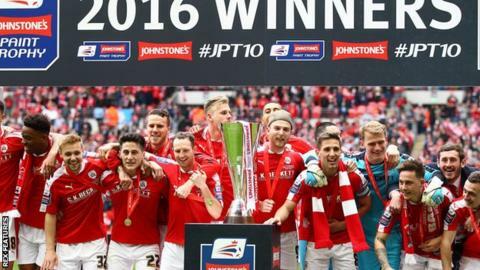 Premier League academy teams will be allowed to play in the EFL Trophy in a one-season trial in 2016-17. In a change from the current knock-out format, there will be 16 regional groups of four for the opening round. The proposals were approved at the English Football League's annual general meeting in Portugal this week. In a statement, the EFL said it was piloting the changes as part of their "ongoing commitment to creating more and better home grown players". The changes will see the 16 academy sides evenly distributed throughout the groups alongside the League One and League Two clubs, with the competition continuing to run on a north/south basis until the final. Each team will play each other once in the group stage, with the academy team getting just one home game. The knockout stages will be single ties apart from the semi-finals, where there will be two legs. At the AGM, clubs approved a 'Rooney Rule'-style application process to try to improve the number of black and ethnic minority coaches in the game. They also discussed the EFL's proposals to add a new division of 20 teams to the English pyramid - meaning that there would be 100 teams in a five-division structure, rather than the current set-up of 92 clubs across four tiers. There are currently 24 teams in the Championship, League One and League Two, below the 20-club Premier League. The final decision on those proposals will be taken in June 2017.